My very favorite holiday is without a doubt Christmas. I love it so much that it’s hard for me to wait till after Thanksgiving to start breaking out the Christmas music and Santa cookie cutters. I try, but I almost never make it! Especially living up here in the mountains where by Halloween it usually looks like Christmas Town! One of my all-time favorite Christmas characters is Frosty the Snowman, everyone’s favorite lovable snowman! 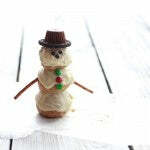 I really wanted to combine my love for Frosty and my love for all things peanut butter. 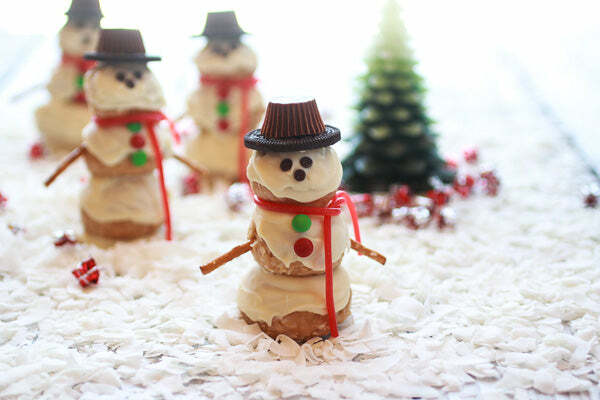 Therefore, I used a family secret peanut butter coconut truffle ball as the base for these adorable Frosty’s. They are crazy easy to make and so delicious. 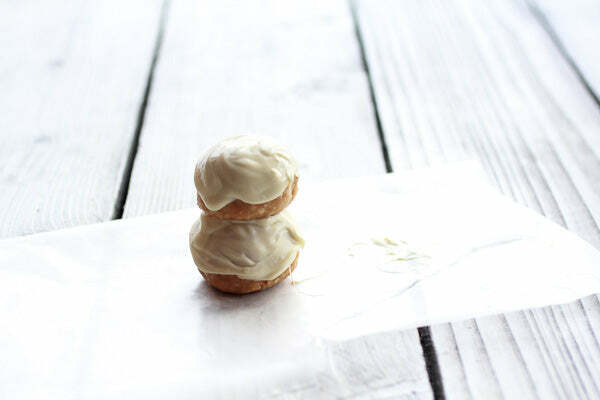 I mean, peanut butter and coconut are a match made in peanut butter heaven, but there is also white chocolate involved! Bonus, people will not be able to get over how incredibly cute they are! 1. 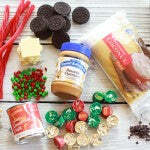 Mix the peanut butter with the sweetened condensed milk and salt. Add the coconut. Mix until the mixture is thoroughly combined throughout. This is easier with a mixer, but can be done by hand. 2. Line a cookie sheet with wax paper. 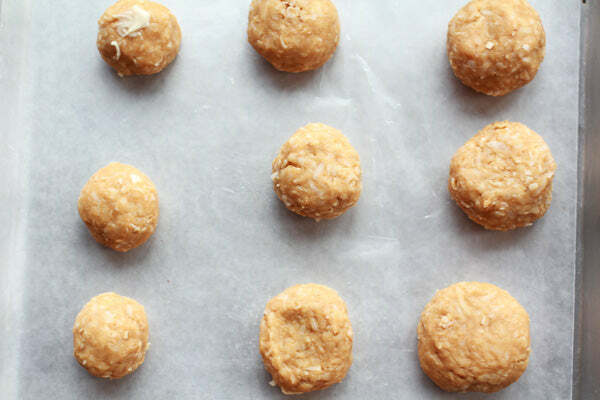 Roll the dough into six balls that are about 2 tablespoons + 1 teaspoon (or 2.35 ounces) in size and place each ball in a row on the cookie sheet. Now roll six more balls, but this time make them a scant smaller, about 2 tablespoons in size (or 1.80 ounces). 3. 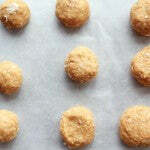 Place each ball on top of one of the larger balls on the cookie sheet. Finally, roll six more balls, about 1 and half tablespoons in size (or 1.25 ounces) and place these on top of the second balls. You should now have six stacks of peanut butter balls stacked in order from largest to smallest. Make sure the stacks seem stable and that the balls have been molded to the right shape to stay in place. 4. Now un-stack the balls and place them flat side down on the cookie sheet one above the other so you have 6 columns and three rows. Place the pan in the freezer for 30 minutes. 5. 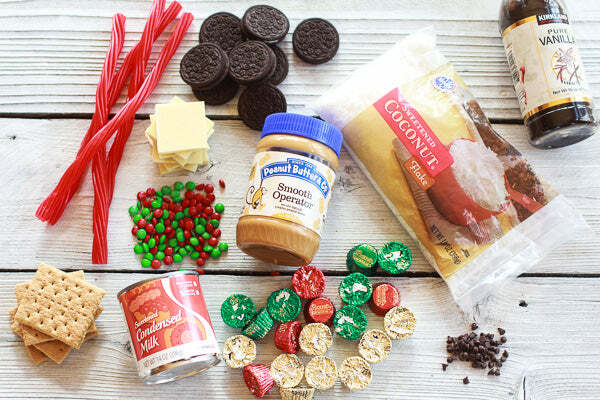 While the peanut butter balls are chilling, make Frosty’s hats by placing just a smidge of peanut butter in the middle of each Oreo cookie. Then place a mini peanut butter cup up side down right into the peanut butter. The peanut butter will act as glue and hold the peanut butter cup in place. Set aside. 6. 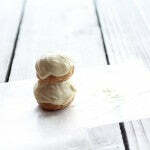 Before you remove the balls from the freezer, melt the white chocolate in the microwave or over a double broiler. I prefer to microwave, heating the chocolate on full power for 30 seconds, stir, 30 seconds again, then stir until melted. 7. Remove the balls from the freezer. 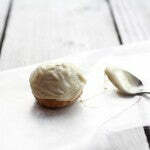 Working with one Frosty at a time use a small spoon to spoon a teaspoon of white chocolate over the large bottom ball. You just want the chocolate to cover the top of the ball and ¾ the way down the sides. 8. 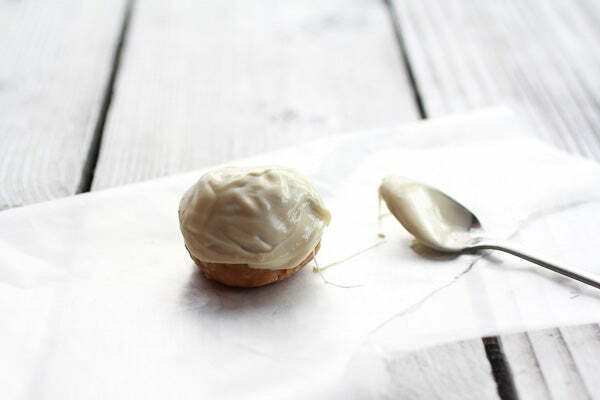 Now place the medium ball (middle ball) on top of the large bottom ball and hold in place for 30 seconds or until the white chocolate has hardened around the bottom of the middle ball and is secure. 9. Next take another few teaspoons of white chocolate and spoon it over the middle ball. Working quickly so the chocolate does not harden, take two pretzel sticks and stick them into either side of the middle ball to make Frosty’s arms. 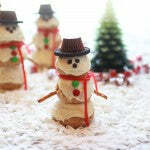 Then add three mini M&M’s right down the middle of Frosty’s belly to make his buttons. Now take the final ball and place it right on top of Frosty’s belly and hold it into place for 30 seconds or until the white chocolate hardens and holds Frosty’s head into place. Spoon a teaspoon or so of white chocolate over Frosty’s head and then place his hat (the one made in step 4) right on top of the melted chocolate and carefully push it into place. Add two mini chocolate chips for his eyes and 1 mini chocolate chip for his nose. 10. Finally tie a red Twizzler rope around Frosty’s neck (between the middle and top ball) to make his scarf. Repeat with the remaining balls. Place the Frosty in the fridge for 30 minutes or until ready to serve. Make sure to keep the Frosty’s cold or they may slip out of place! 11. If it is warm in your kitchen I recommend leaving the balls you are not working with in the freezer while you assemble each Frosty. 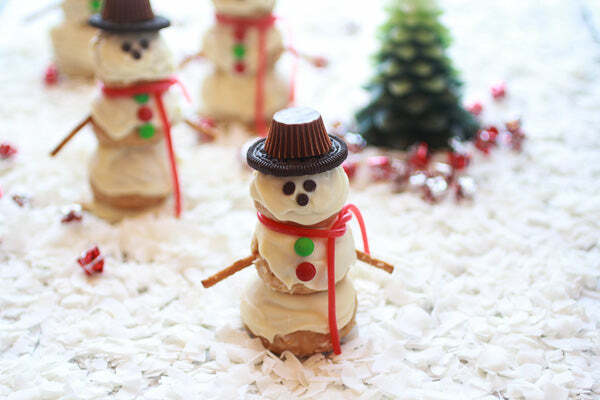 Once the Frosty is completed place them back in the fridge so they will stay cool. 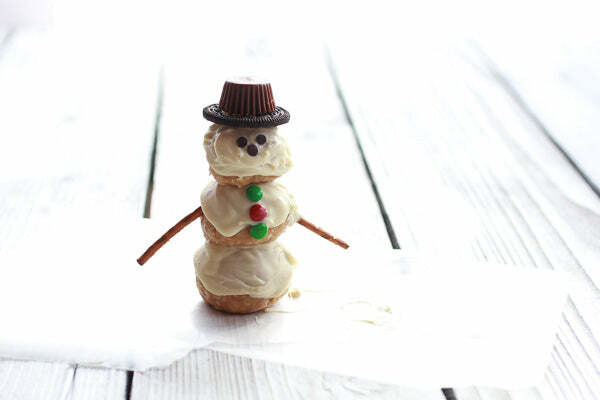 What other fun holiday characters do you like to recreate with food? – The giveaway is open to USA residents only and will run until Monday, December 30, 2013 at 11:59 PM EST. – Winner(s) will have until 1/2/14 to claim their prize or we will choose another winner. 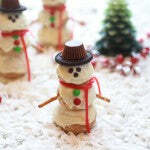 The post White Chocolate Peanut Butter Coconut Frosty the Snowmen appeared first on - Peanut Butter & Co. Recipe Blog.